Start by creating a new solution (click File > New Solution). 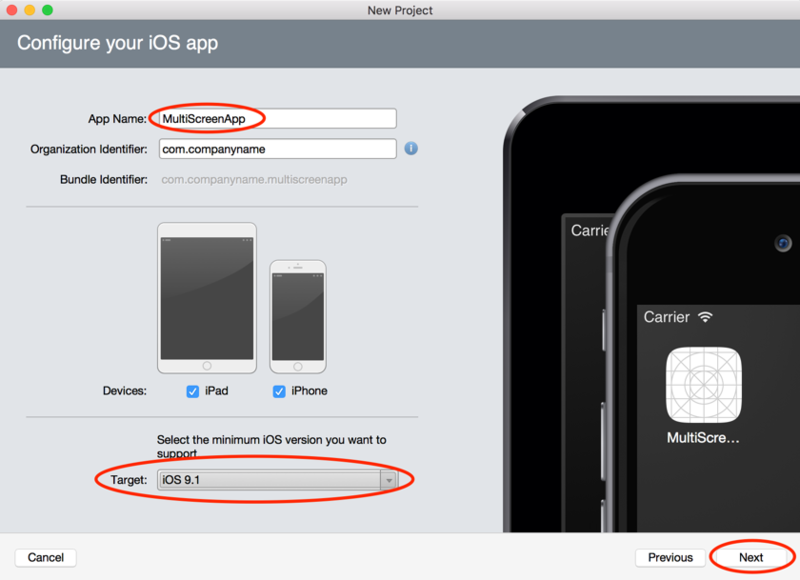 Give your app a name, select a minimum supported iOS version and click Next. 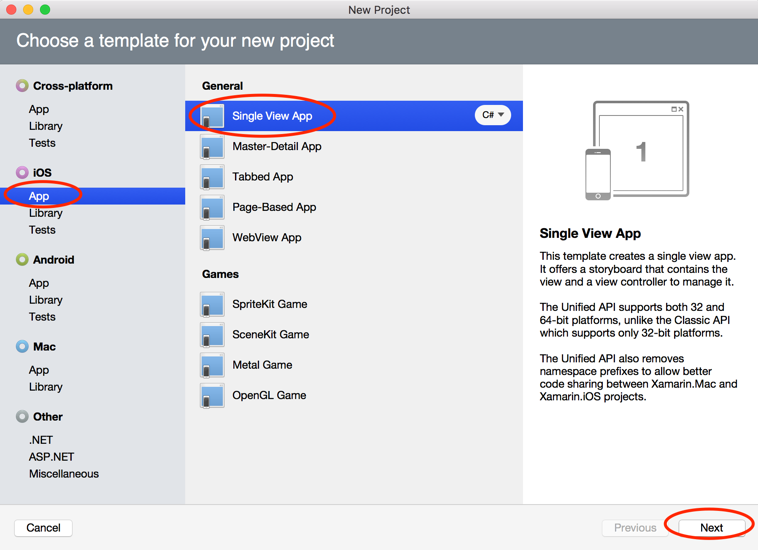 Confirm the project and solution names, the project folder location and click Create. 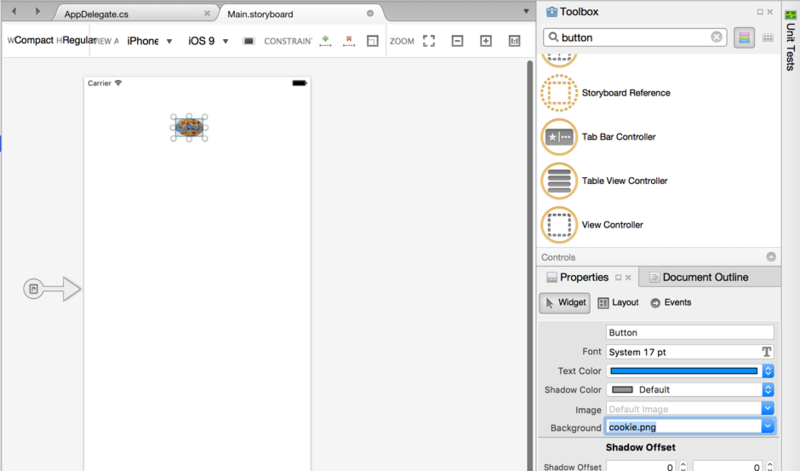 Open the Main.storyboard file and drag a Button element on to the screen. Give it a name and change its text value. 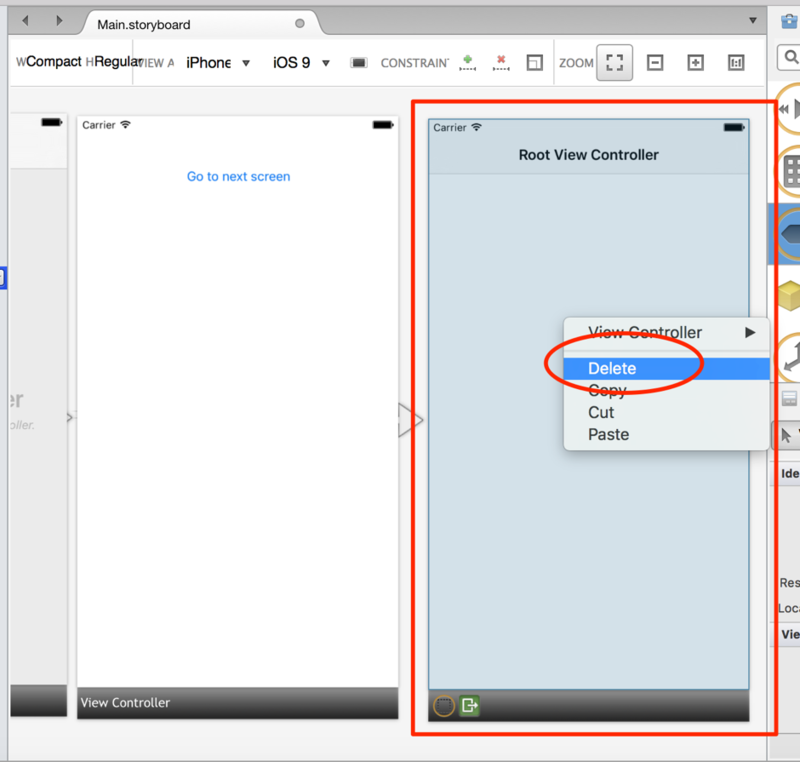 Right-click the Root View Controller and click Delete. 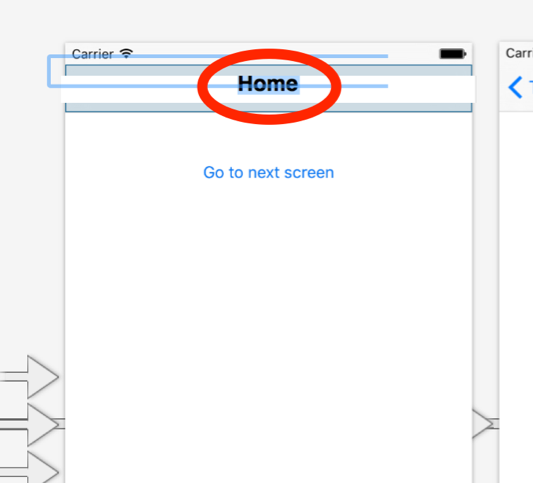 Hold down the Ctrl (Control) key while dragging the Navigation Controller screen to your main screen (you will see a blue line linking the two screens together). 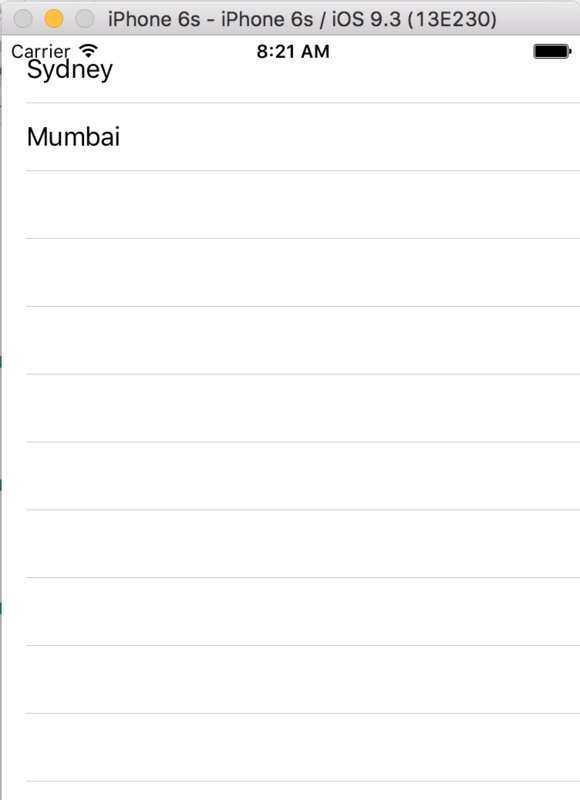 The select Root from the list of options – this will make the main screen the root screen (the screen that loads first when the app starts running). 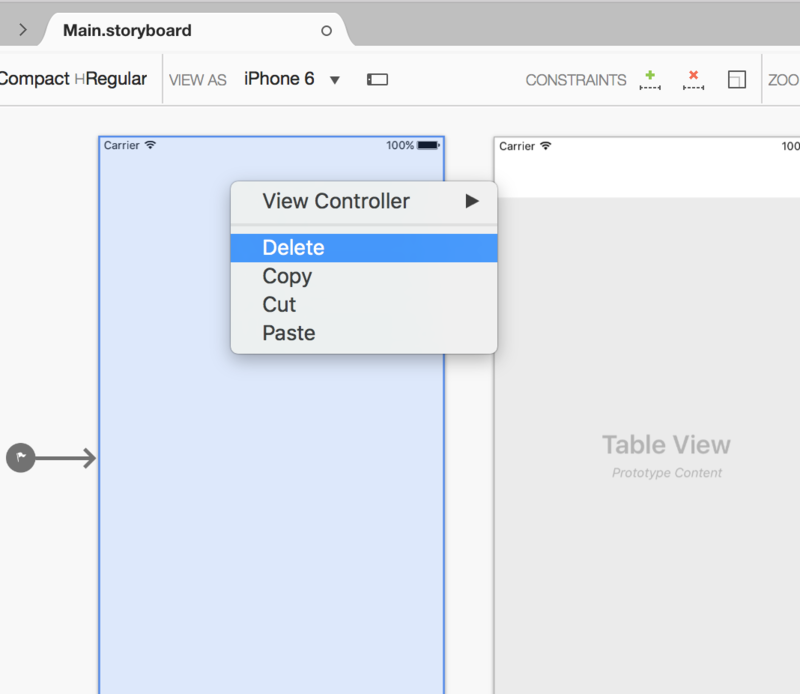 Now drag a View Controller element onto the storyboard and place it to the right side of your main (root) screen. 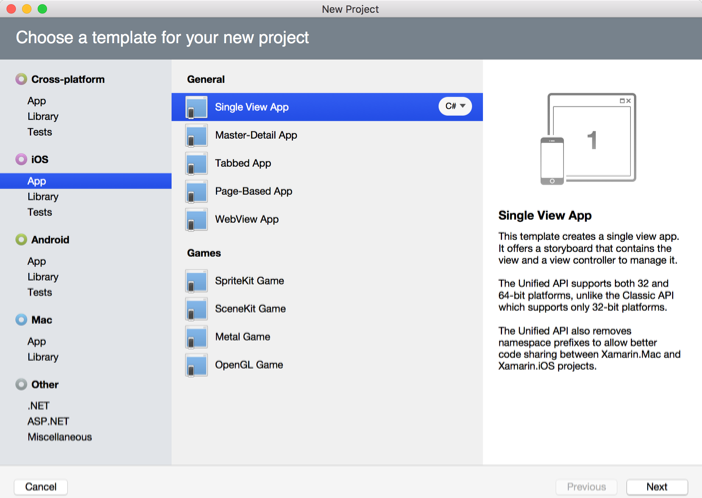 This will create a new screen which will be the second screen in your app. Hold down the Ctrl (Control) key while clicking and dragging the button on the main screen to the second screen. 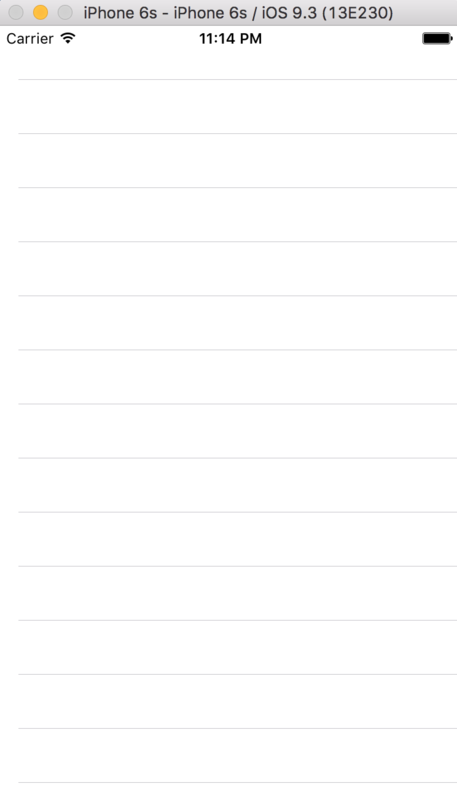 When you see the list of options appear, select Appear. Now we can add a Button to get from the second screen back to the main screen. 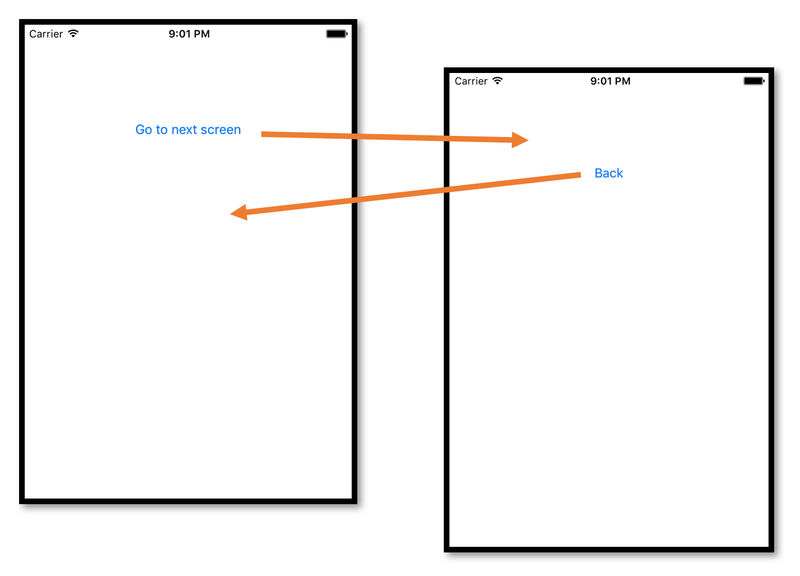 Drag a button element on to the second screen. Give it a name. When you name the first element that you add to a new screen, you will see a yellow warning icon. 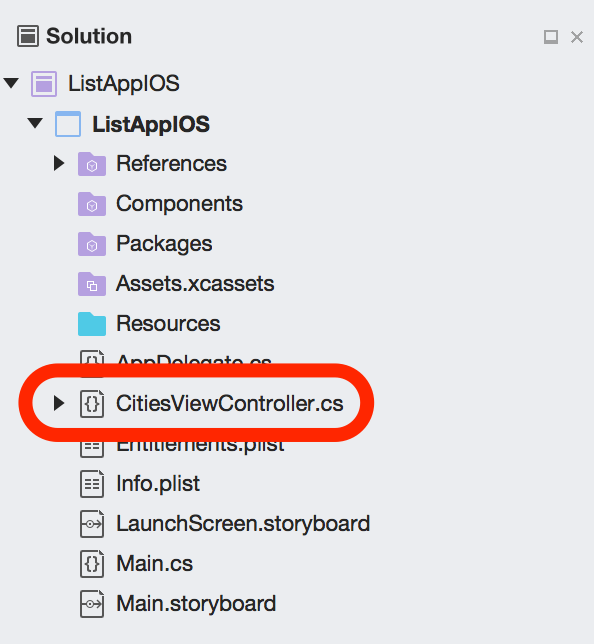 Click it and then you will need to type in the name of the new ViewController for this screen (for example, ScreenTwoViewController)– the name you provide will be the name of a new C# file that will contain the code for this screen. 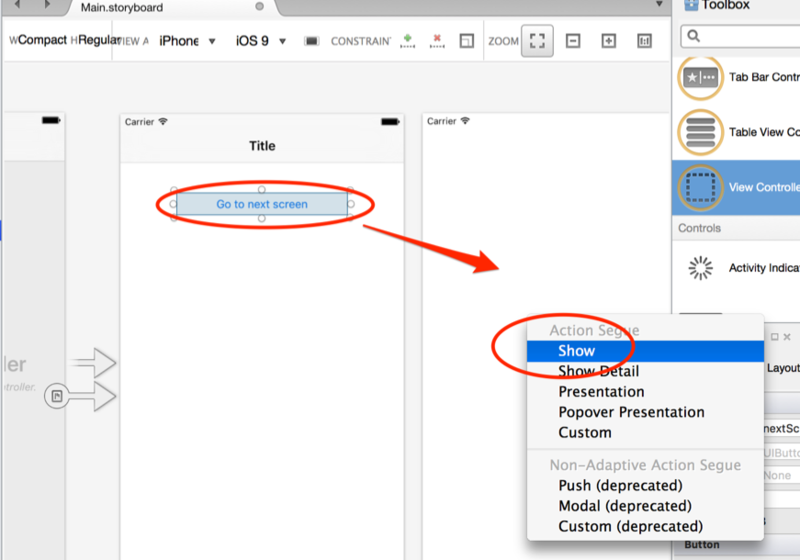 Change the Title property of the button the Back. Now click on the new button on the second screen. Hold down the Ctrl (Control) key while dragging this button to the main screen. Click on Show. 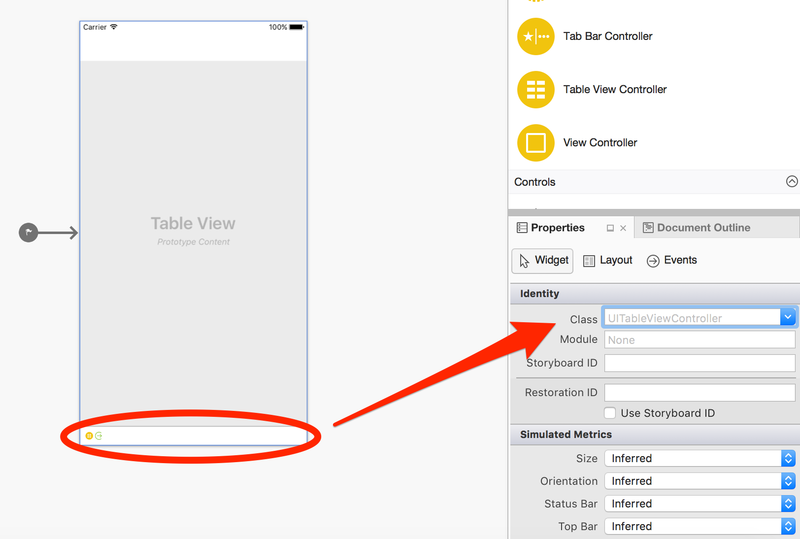 This will make the Back button take the user back to the main screen when they tap it. Lastly, double-click on the main screen’s title so you can rename it. That’s it! 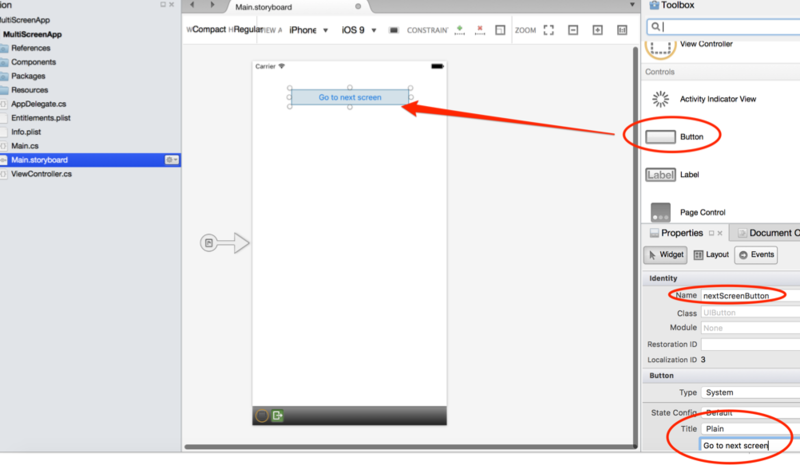 Now you can test out your app. 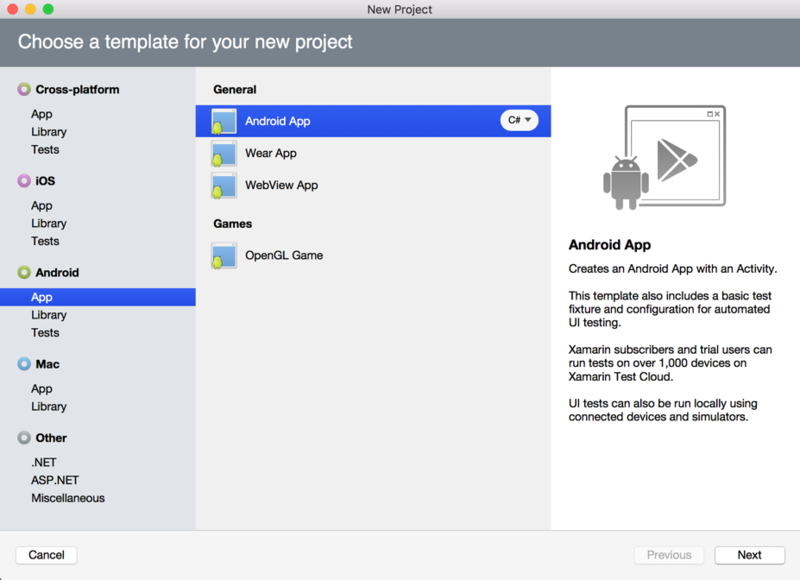 To get started, open Xamarin and click File > New and select Android App from the list of templates. 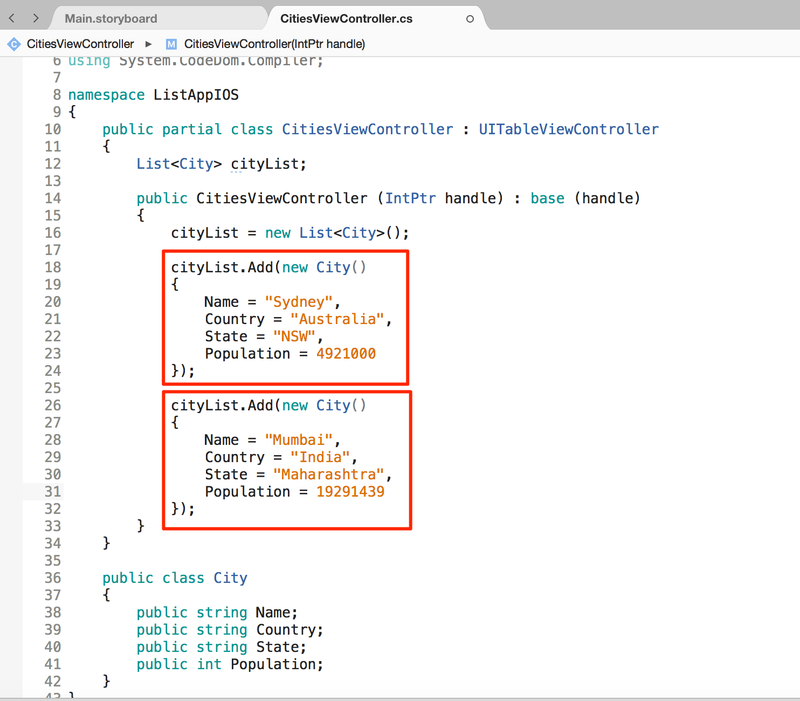 We will be writing this app in the C# language. 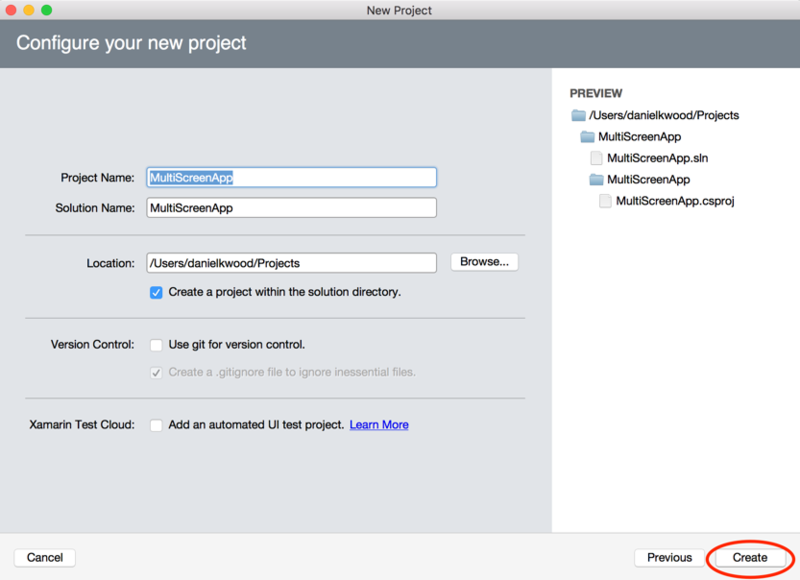 Give your app a name. 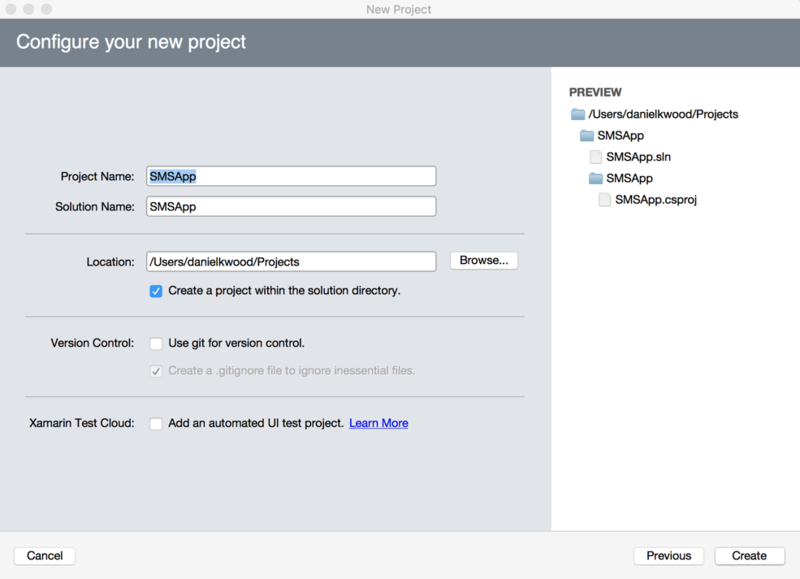 In this example, the app is called SMSApp and Modern Development has been selected as the Target Platform. Confirm the project and solution name as well as the folder the project will be stored in. Then click on Create. Open the Main.axml file in the Resources > Layout folder and delete the ‘Hello world, click me!’ button. 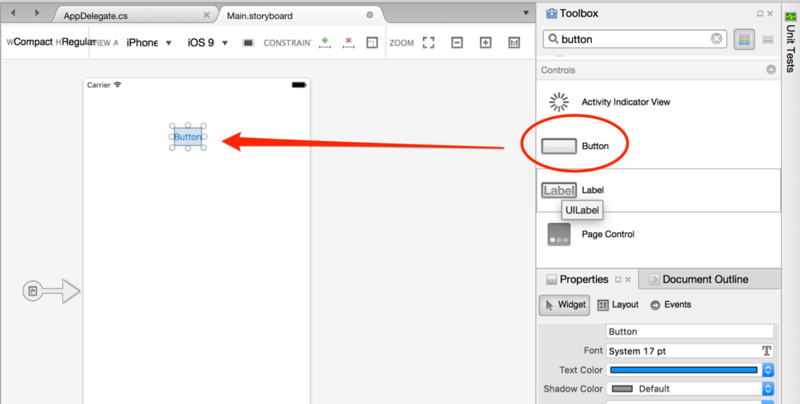 Drag a new Button element from the Toolbox on to the screen. 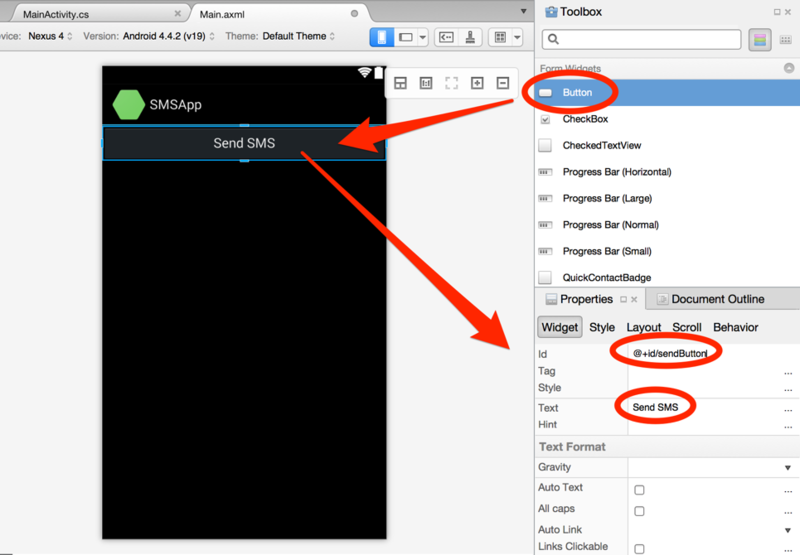 Rename its Id to @+id/sendButton and change the Text value to Send SMS. Now open the MainActivity.cs file to add the code. 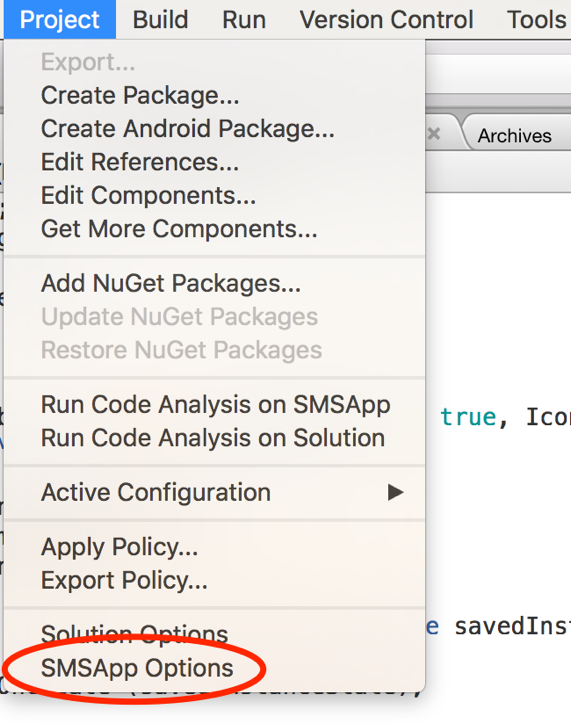 Delete the code that is highlighted below. 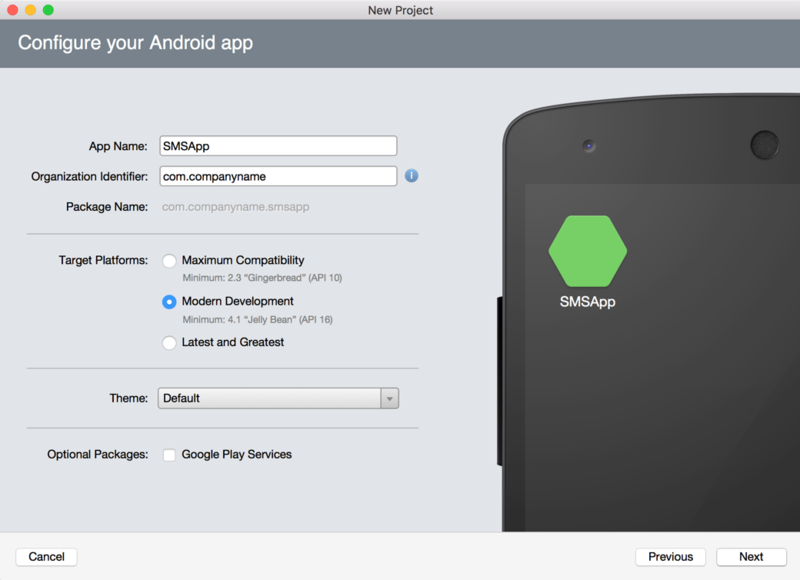 Click on the Project menu and then select the Project Options (it will be the name of your app project – here it is called SMSApp Options). 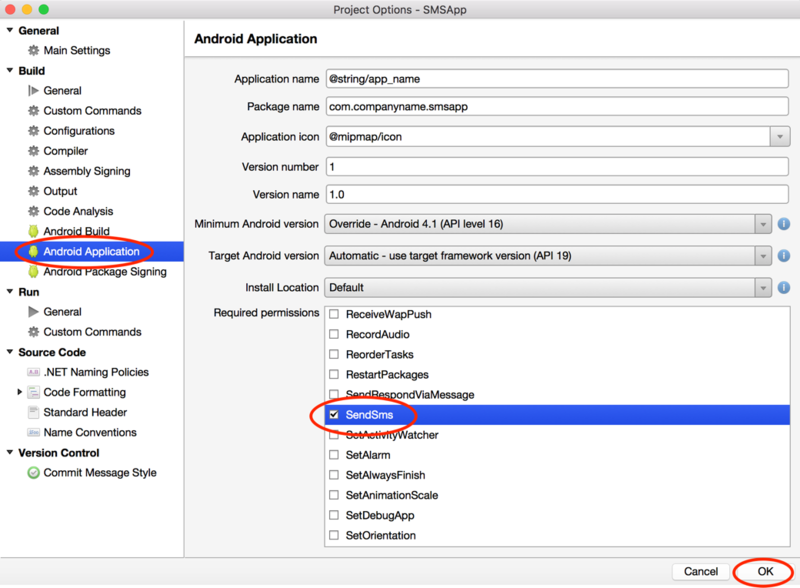 Select Android Application from the list and then in the Required Permissions list, check the SendSms option and click on OK. 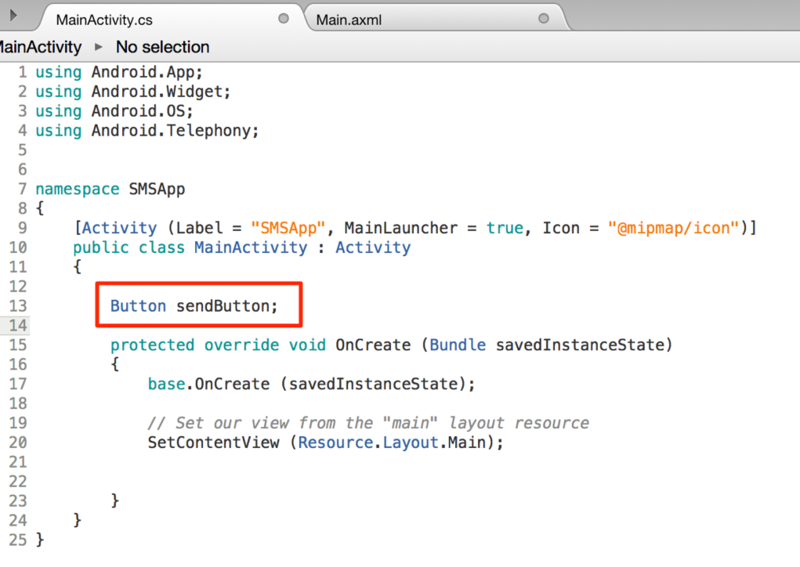 This will allow the app to send SMS messages. 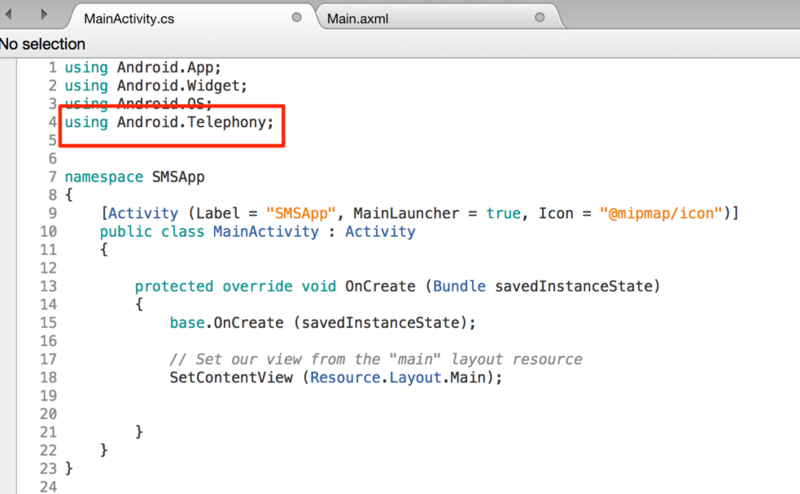 Add the using Android.Telephony; line to the top section of the code. 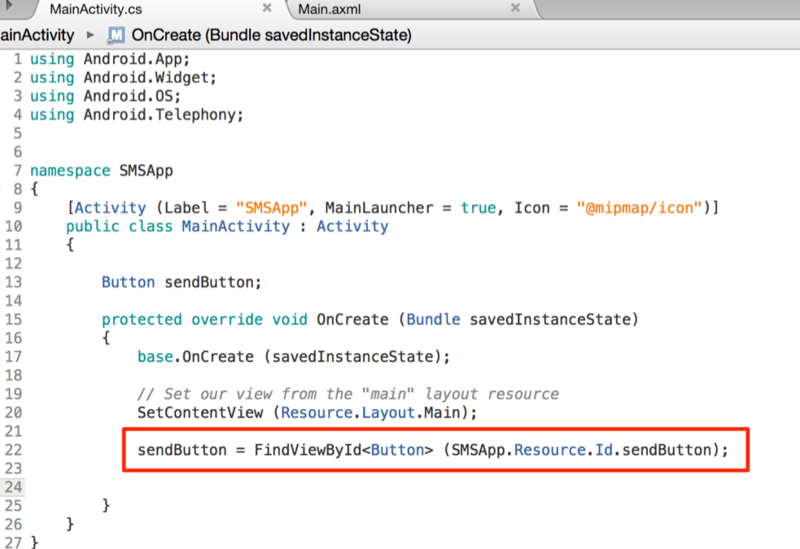 Define the sendButton as a Button element in your code. 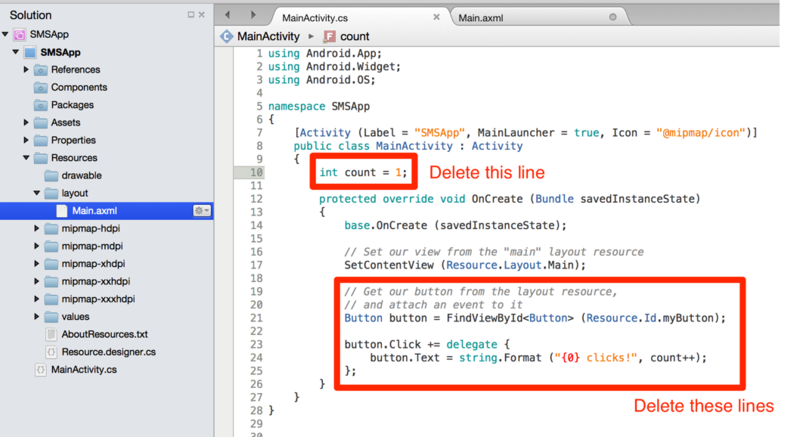 Add the following highlighted line of code to the OnCreate method so that you can access the button element from the screen. 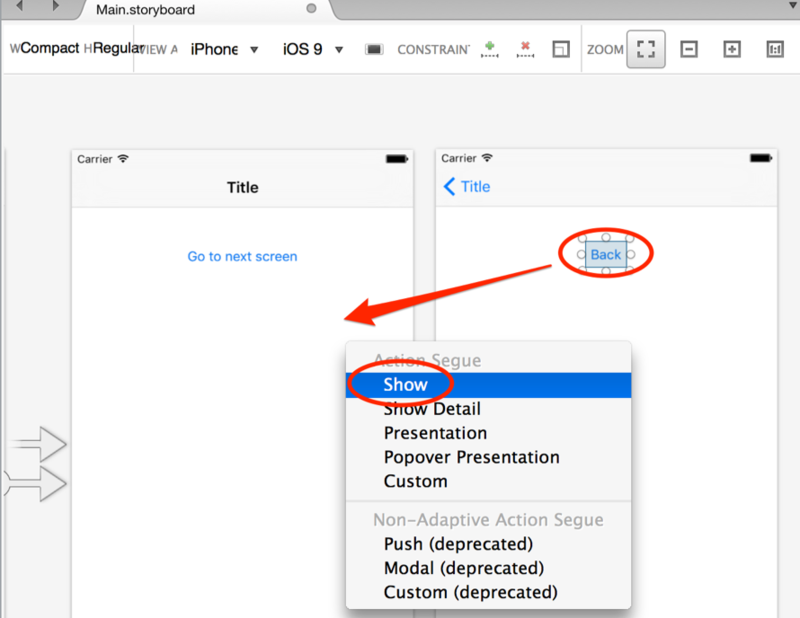 Now create a button click event. 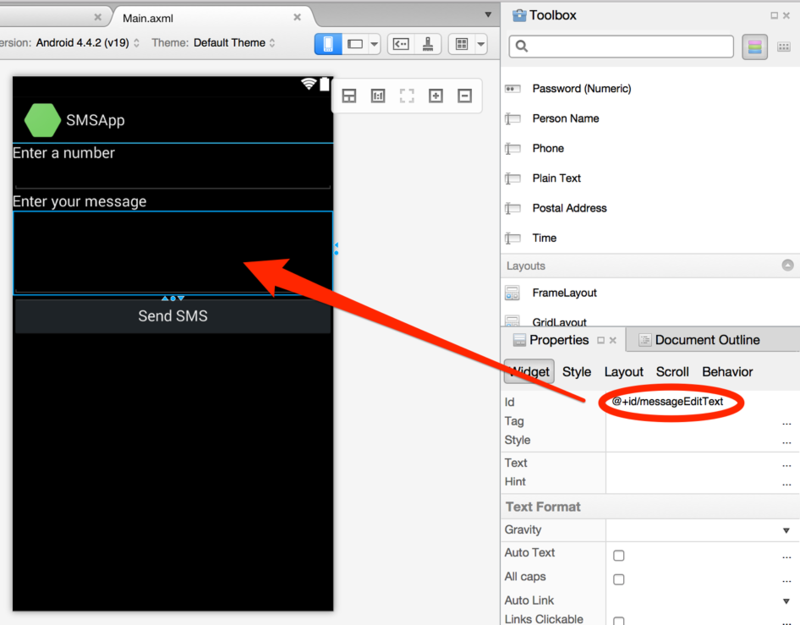 Type in sendButton.Click+= then press the spacebar. 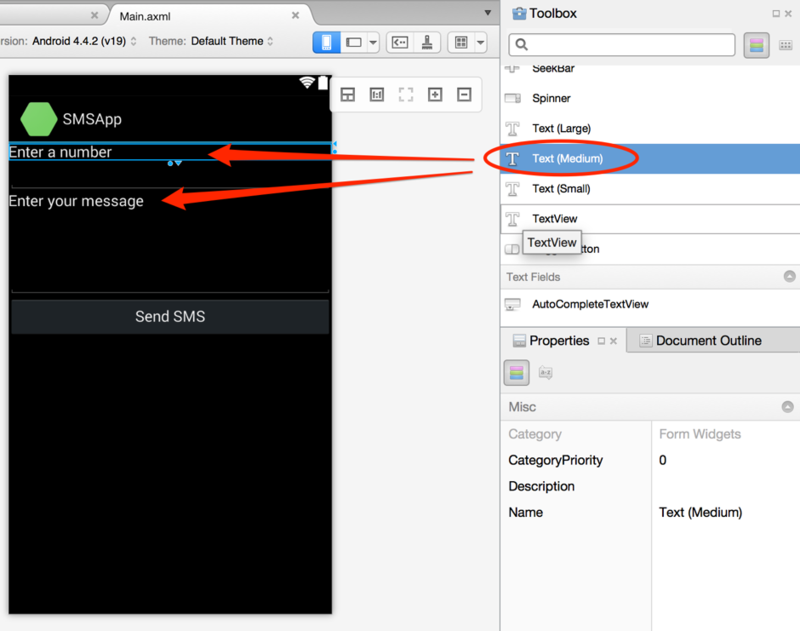 Double-click the option to create the SendButton_Click method. 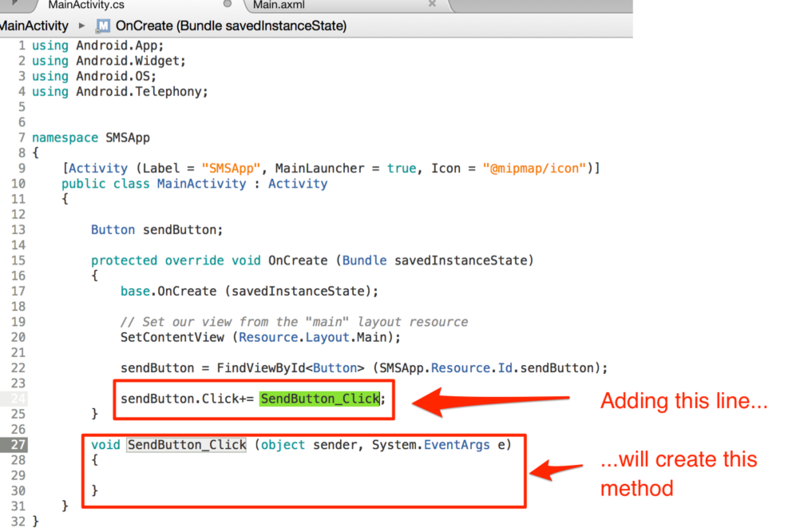 Inside the SendButton_Click method, add the following highlighted code. There are two values that you need to change. The phone number (shown as 0123456789 above) needs to be changed and also the SMS message contents (shown as Hello world above). Change these values as you like. 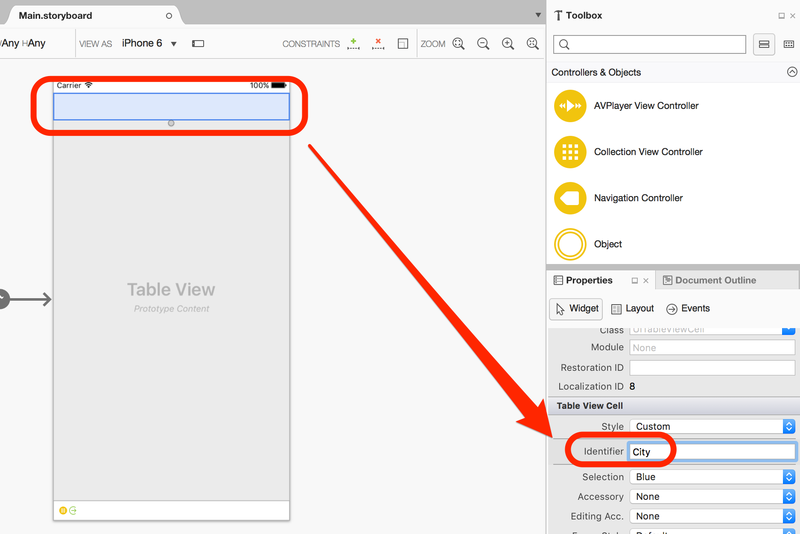 You can also get values from existing variables here or from user input in text fields. 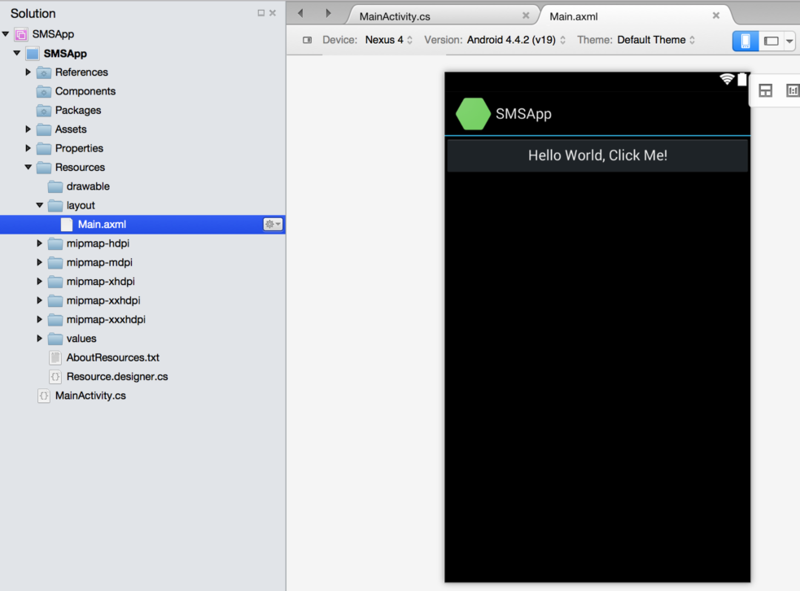 Now go and test your app on a phone with a working SIM card. 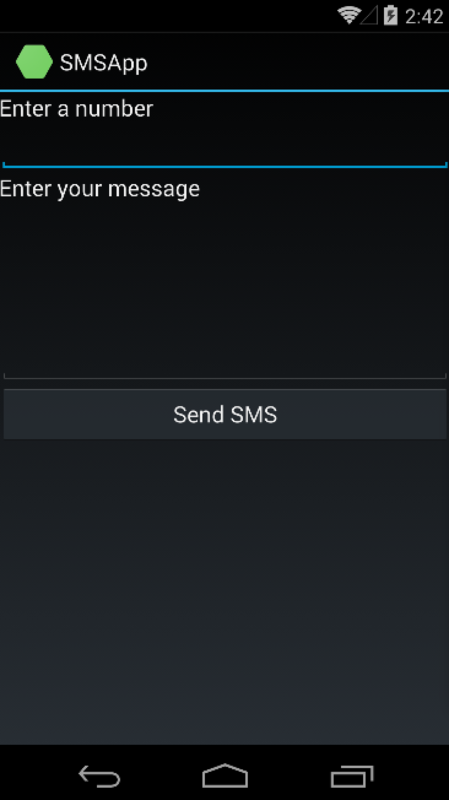 Now we will allow the user to enter in a number and a message to send. We will need to add a couple of text labels and text fields to the screen. Open the Main.axml file. 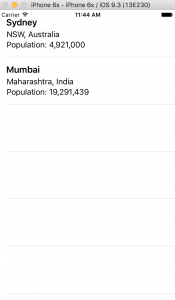 Add two Text (Medium) elements and two Plain Text elements as shown below. 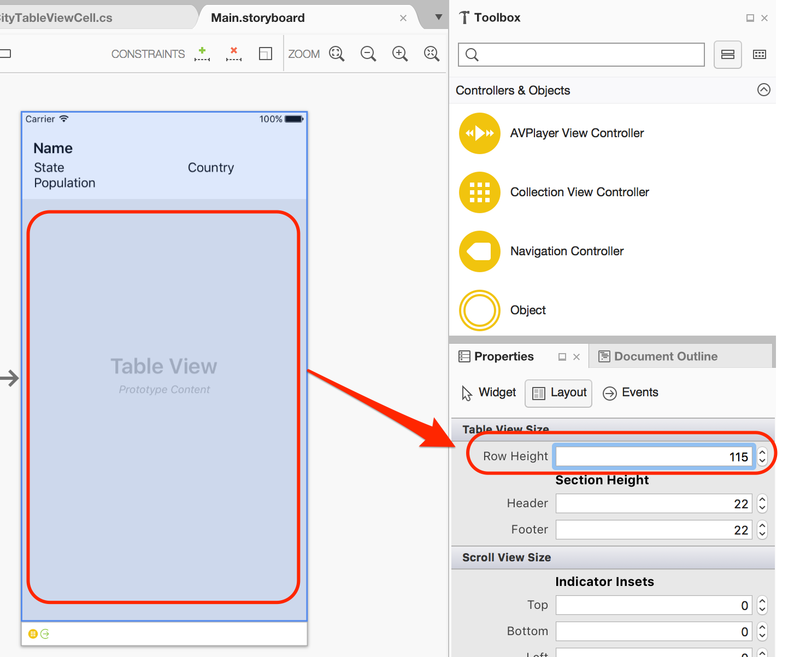 The Text (Medium) elements should ask the user to enter a number and enter a message. 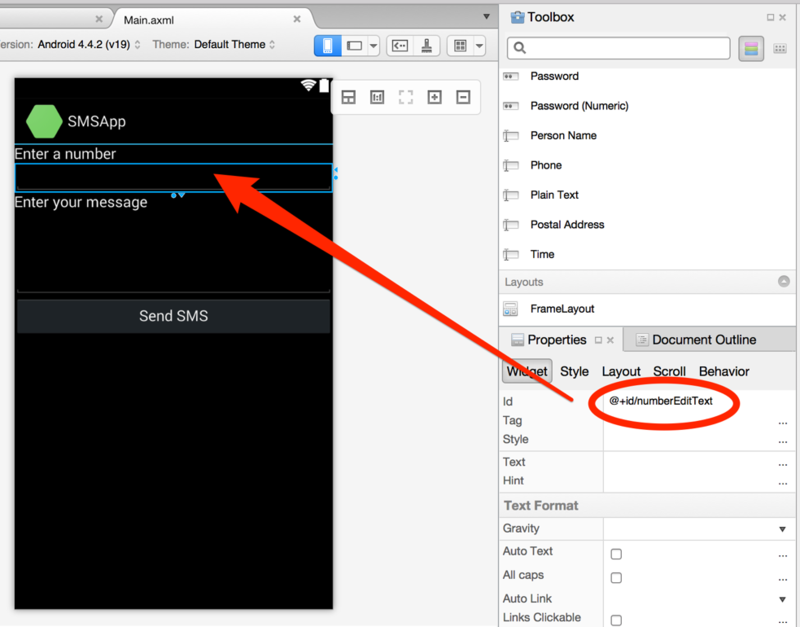 Rename the first Plain Text element (under Enter a number) to @+id/numberEditText. 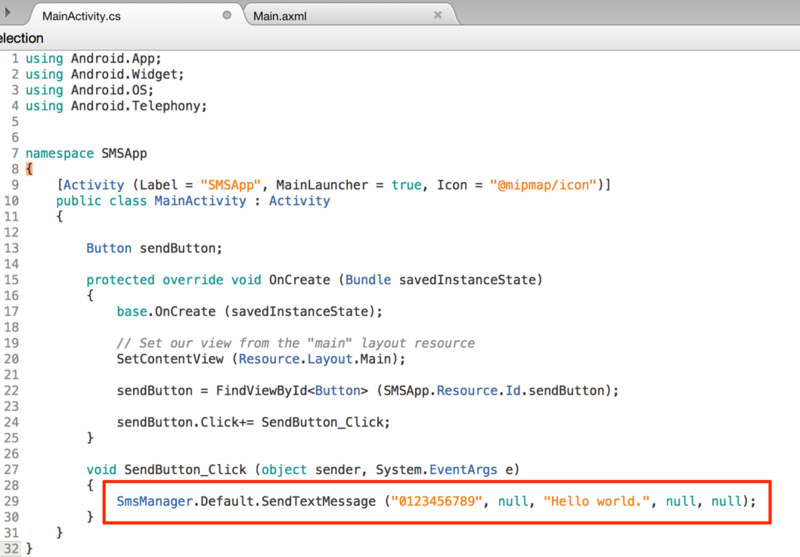 Rename the second Plain Text element (under Enter a message) to @+id/messageEditText. Go back to the MainActivity.cs code. 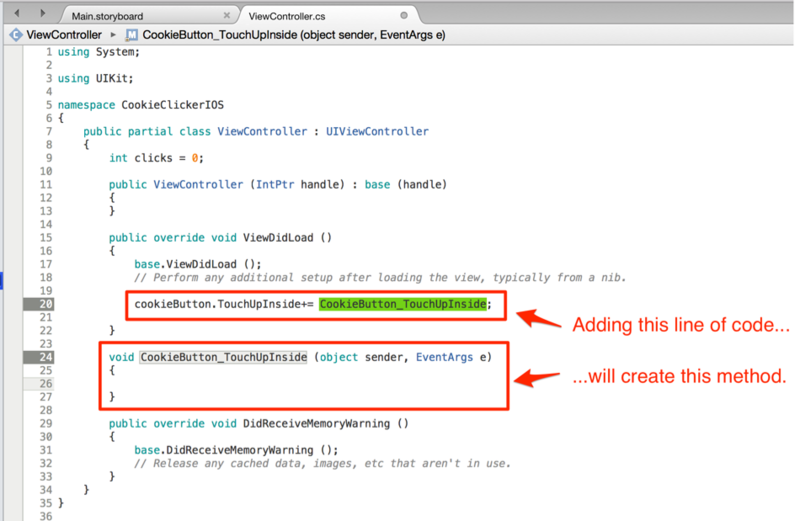 Modify the code by adding the highlighted lines of code shown below. 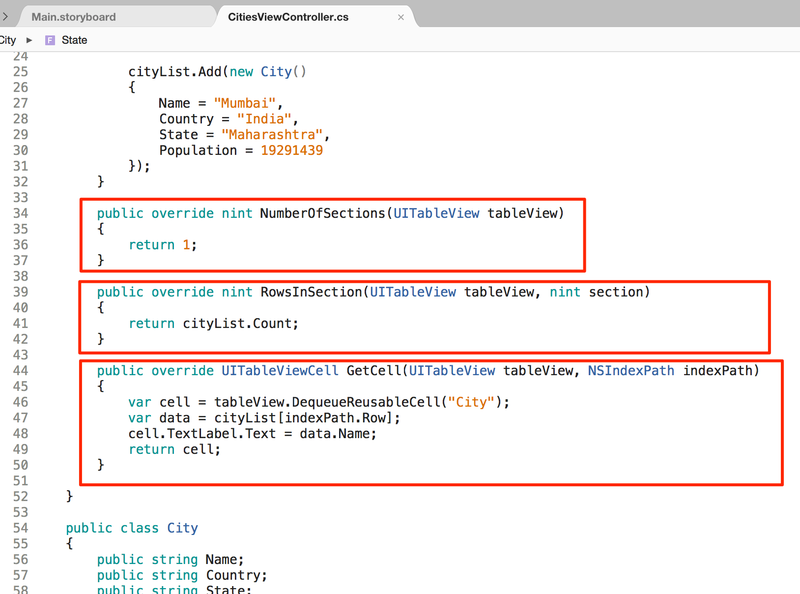 You firstly need to define the EditText elements in the MainActivity class (lines 11-12) and then allow the code to access these elements from the screen (lines 22-23). 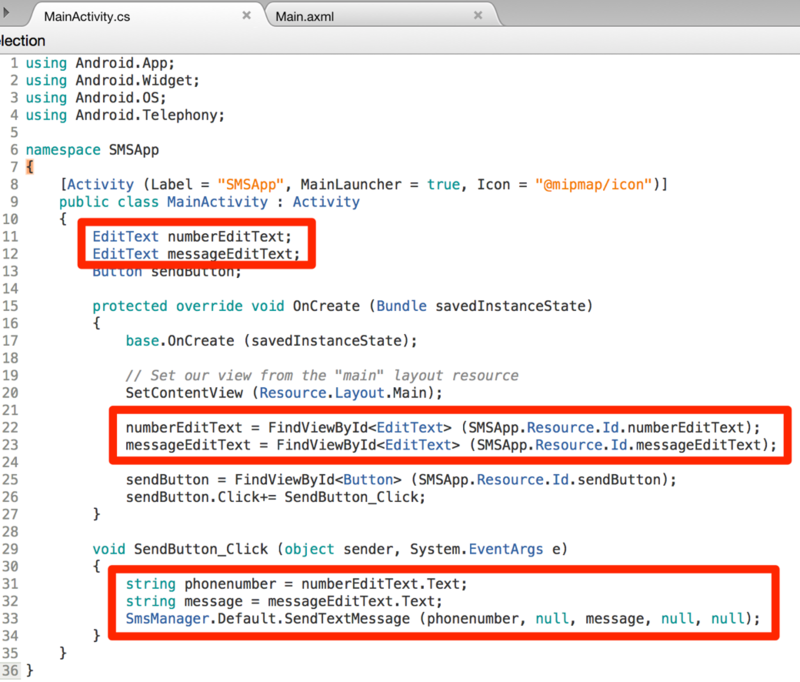 Then you need to modify the SendButton_Click method so that the text entered by the user (the phone number and the desired message) are saved in string variables (lines 31-32). These variables are then used in line 33. That’s it! 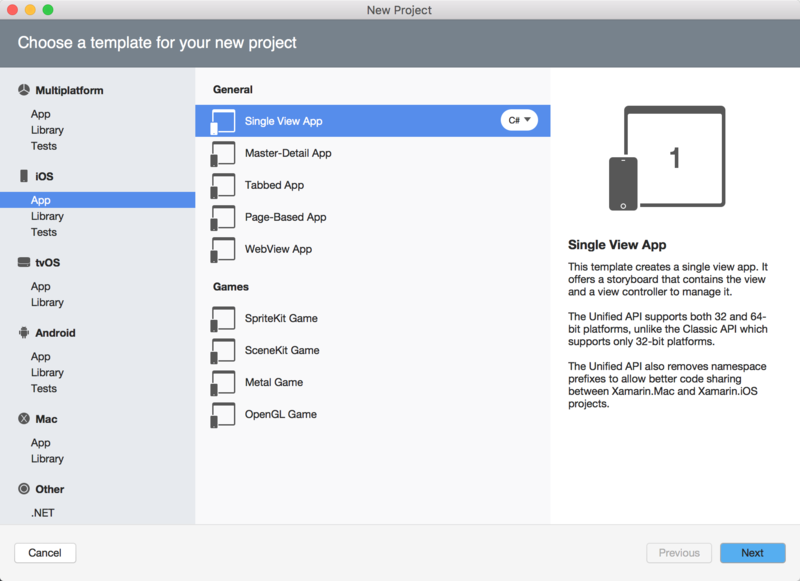 Now go and test your completed app. 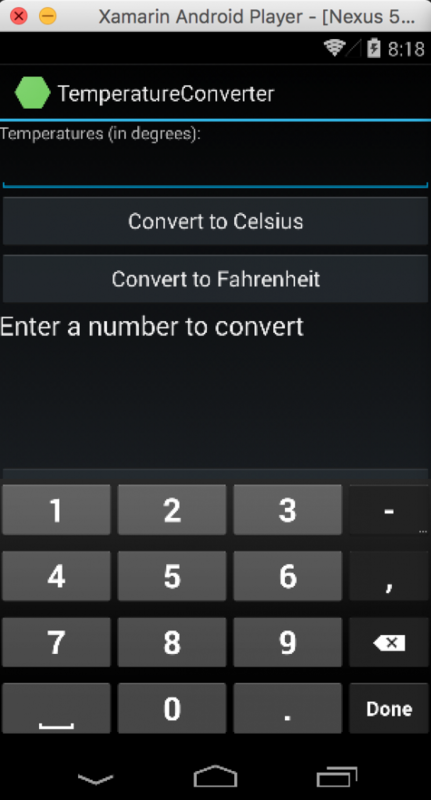 In this tutorial we will look at how to improve the code in the Temperature Converter App for Android from the previous tutorial. If you have tested the app yourself, you might notice that the app works great when the user enters only numbers. However, what happens when a user enters nothing at all? The app will crash! The code below is from the same app but has some new code added to it. 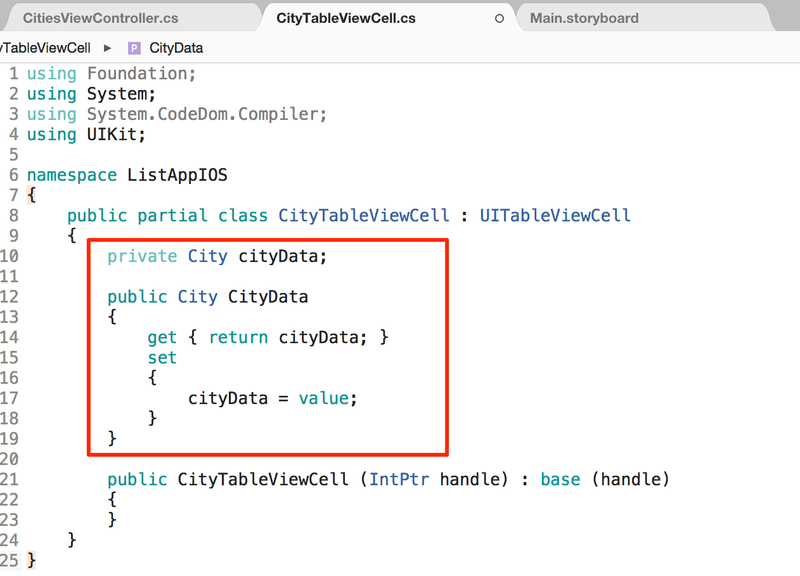 All of the code is commented, explaining what each new line does. None of the design elements (buttons, labels, text fields) have been changed in any way. 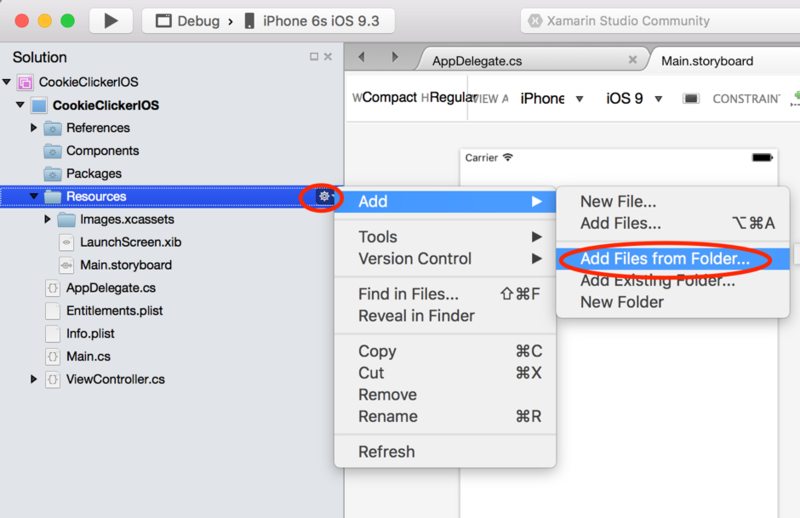 In this tutorial we will make a Cookie Clicker game for iOS mobile devices using Xamarin.We made the same app for Android in a previous tutorial and now we are going to make it for iOS devices. 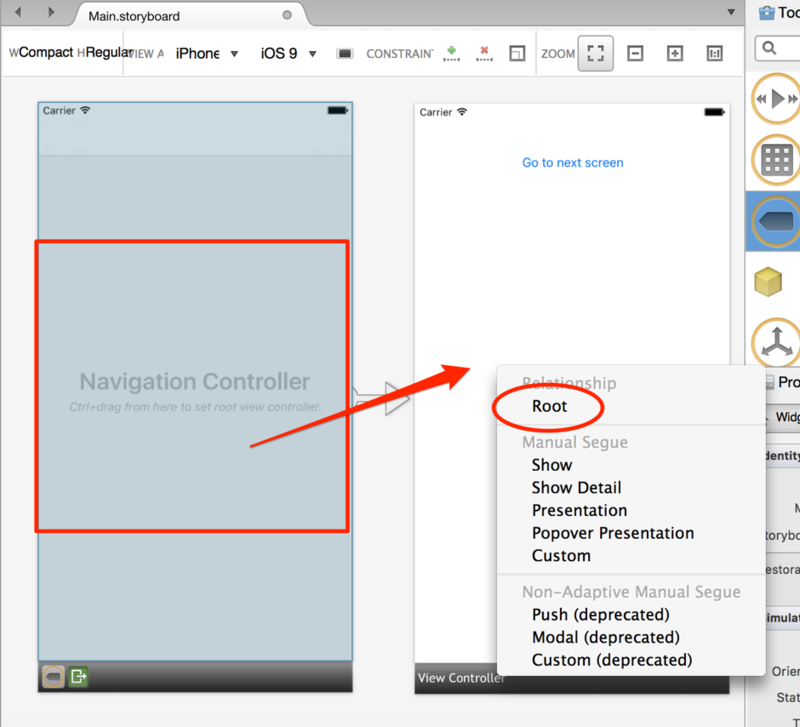 You will also learn how to use images for buttons instead of plain text. 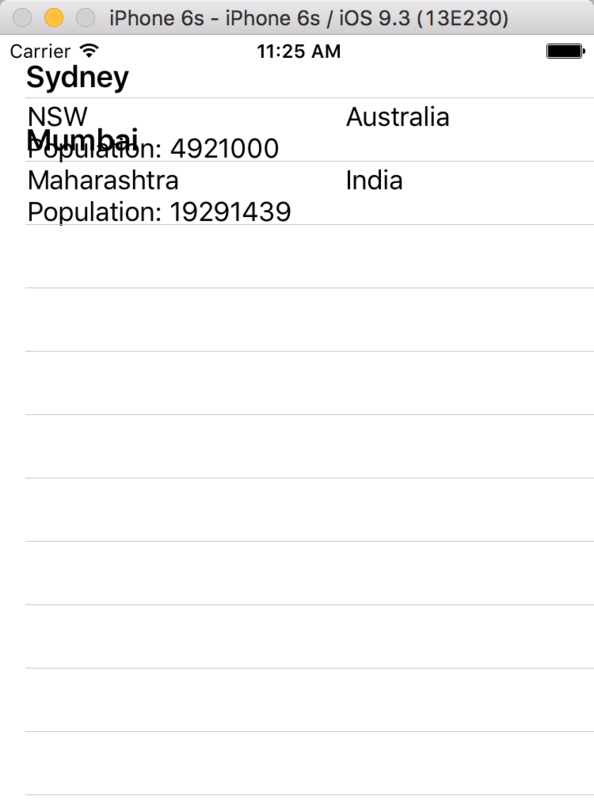 This is what the basic working app will look like but you can improve the look of it by change the text and background colours and by adding more options. Watch the video below or scroll down for the full instructions and sample code. Start a new Solution (File > New > Solution). 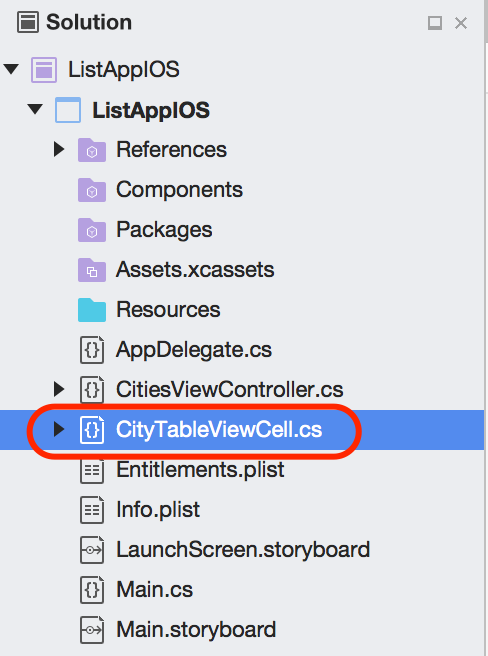 Select App under iOS and then select Single View App. Click on Next. 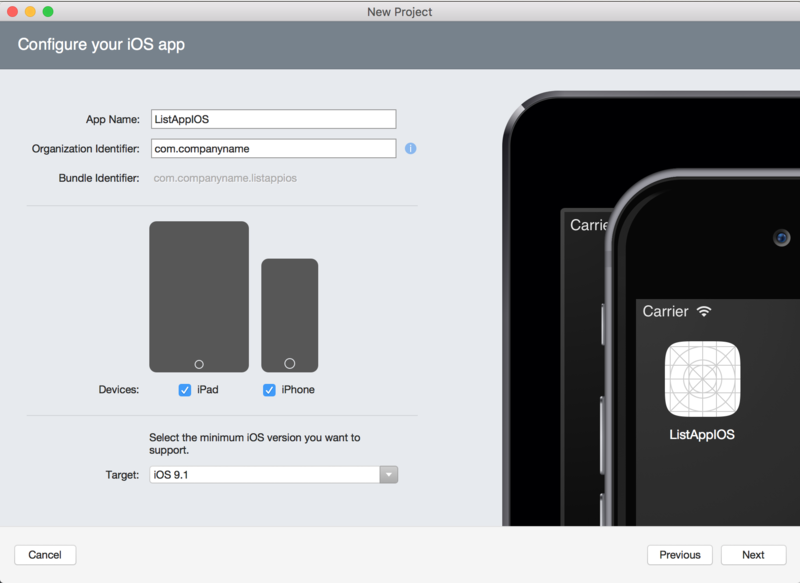 Give your app a name, select the minimum iOS version you want to support and click Next. 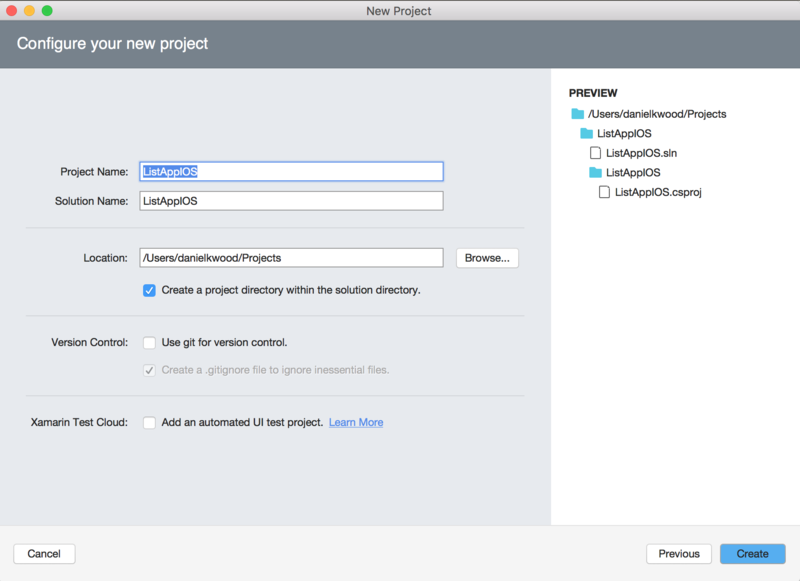 Give your project and solution a name (you can keep it as the default) and then choose the location where you will store your project (eg. the Projects folder). Then click on Create. 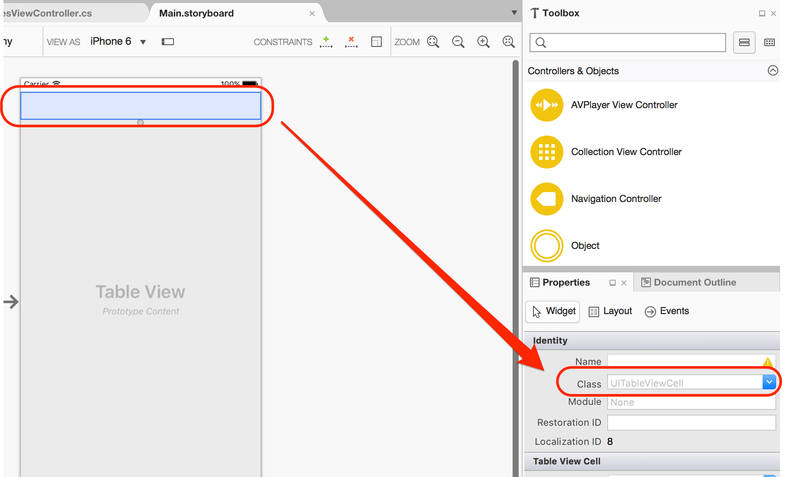 Open the Main.storyboard file (in the Resources directory). 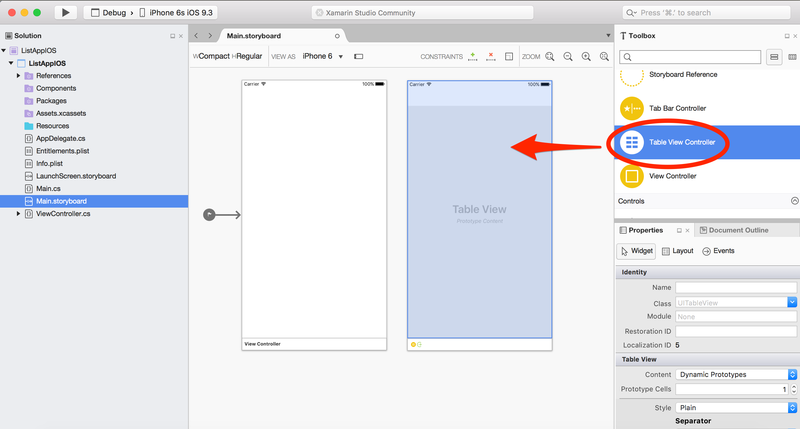 Change the view from Generic to the iPhone model you are targeting (eg. iPhone 6S). 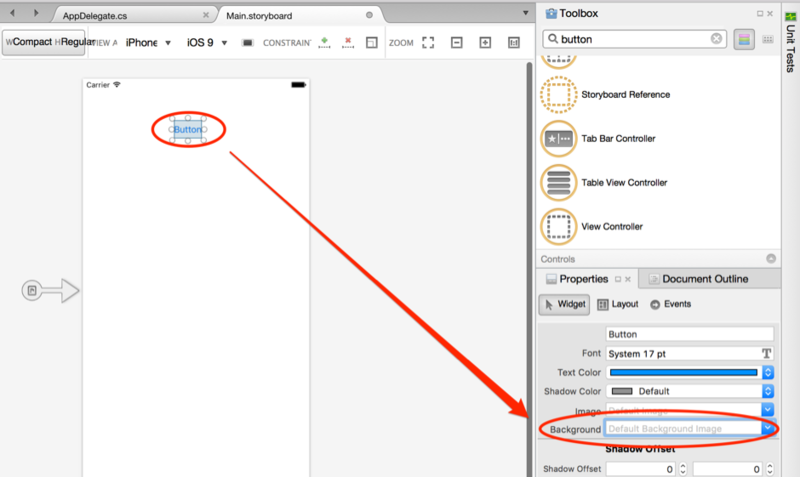 Drag a Button element on to the screen from the Toolbox. 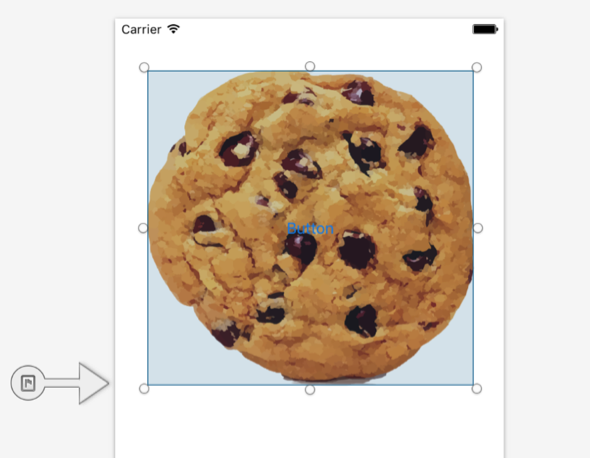 You will need a cookie image for your app. Once you have an image on your computer, select the Resources folder. 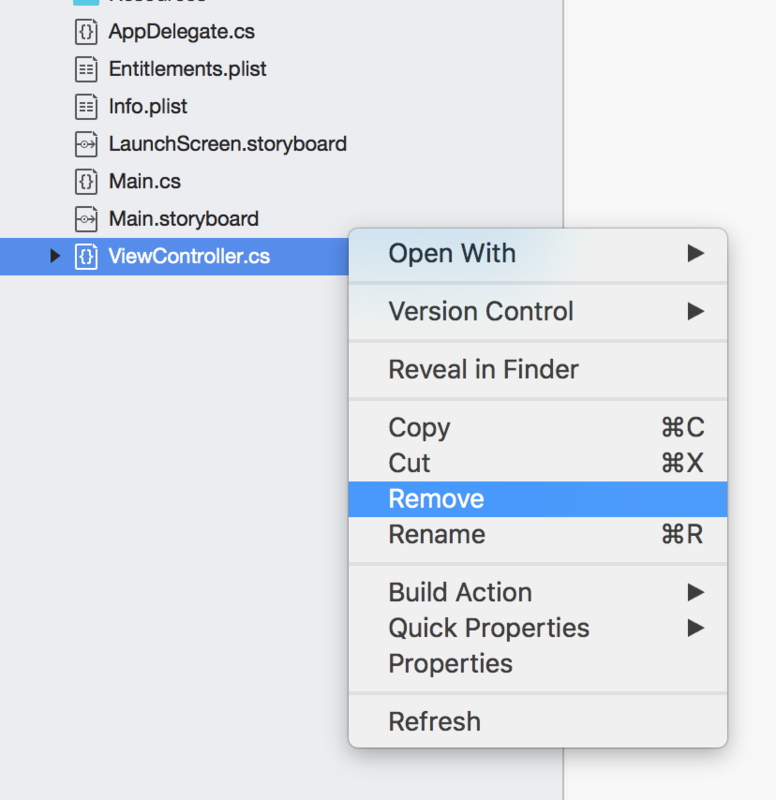 Click the cog icon, then Add > Add Files from Folder. 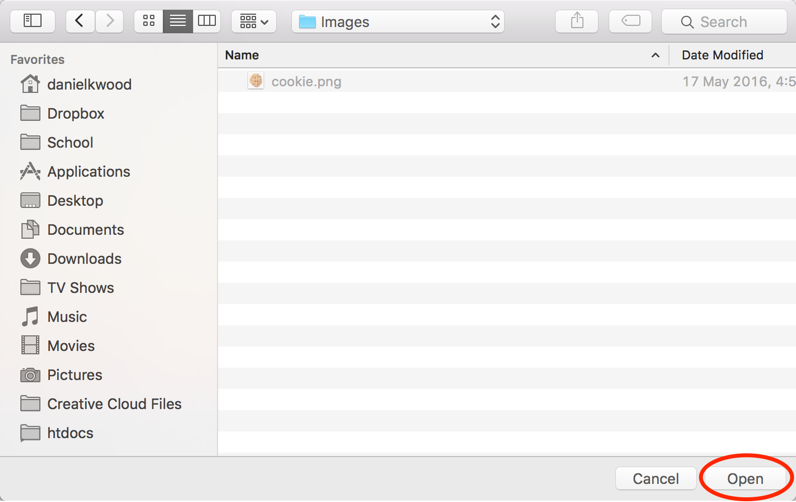 Find the folder that contains your cookie image. Then click on Open. Click the checkbox next to the image you want to use and then click OK. Choose Copy the file to the directory and then click OK.
You should now see the image in the Resources directory. 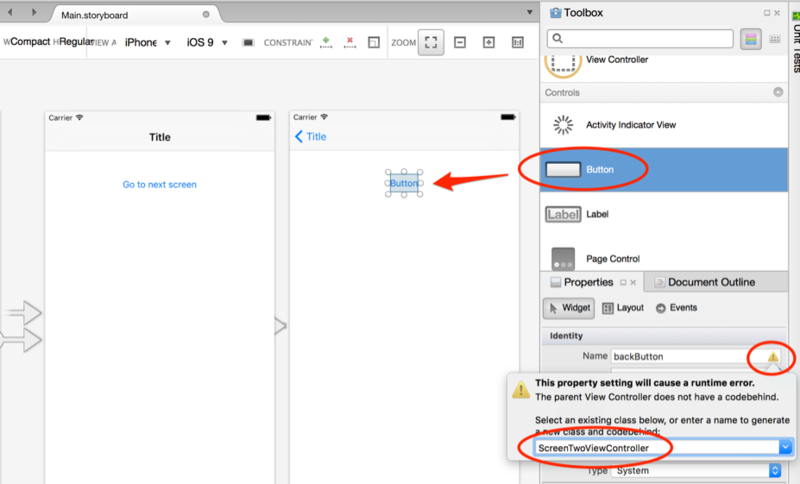 Now select the Button you added earlier and from the Widget tab on the Properties panel, scroll down until you see the Background property. Click the dropdown box and choose the image you want to use (eg. cookie.png). Alternatively, type in the filename in the text box. 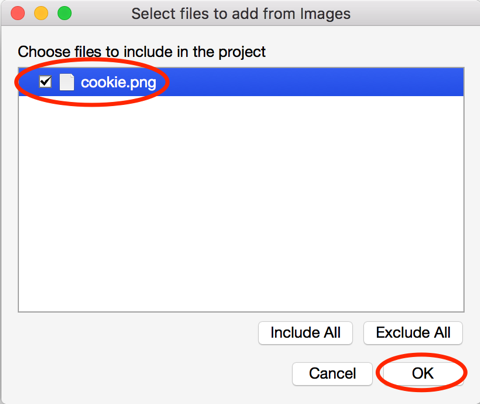 Now you have a cookie image as the background for your button. However, the button is very small so it will need resizing. 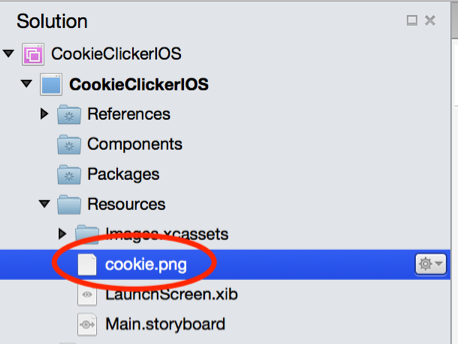 Click and drag the corners of the button to enlarge it so that the background image of the cookie is nice and clear. 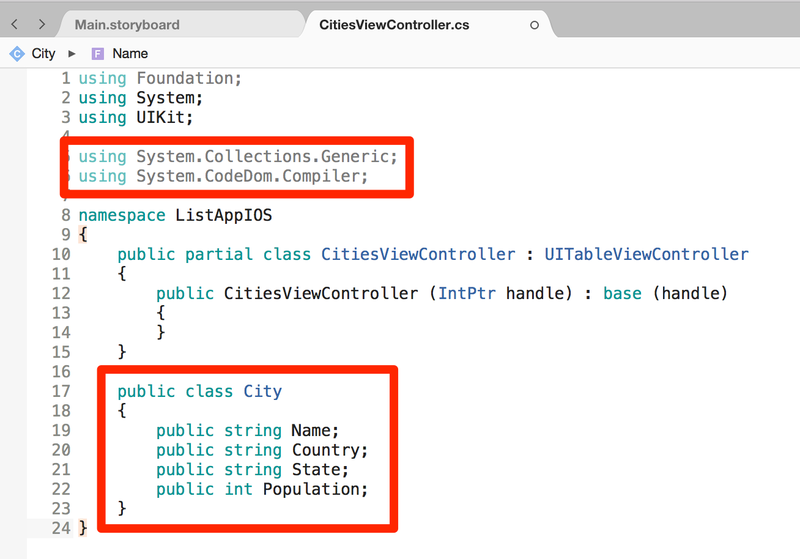 Now go and remove the Default title value under Title on the Properties panel so that the button text is no longer visible on the button. 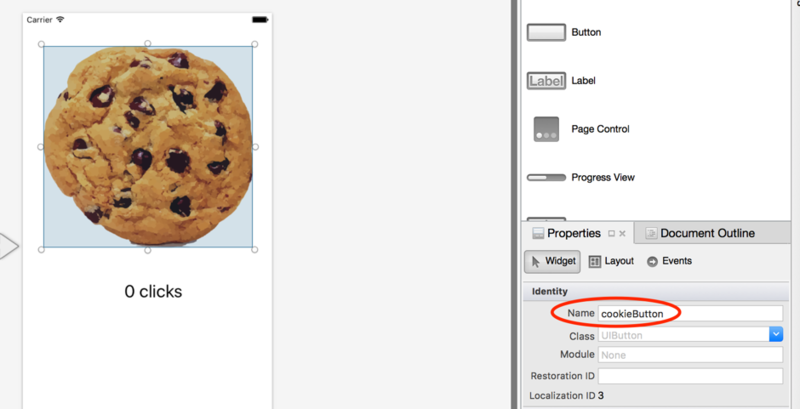 Add a Label element to the screen under your cookie button and change its Text value to say ‘0 clicks’. 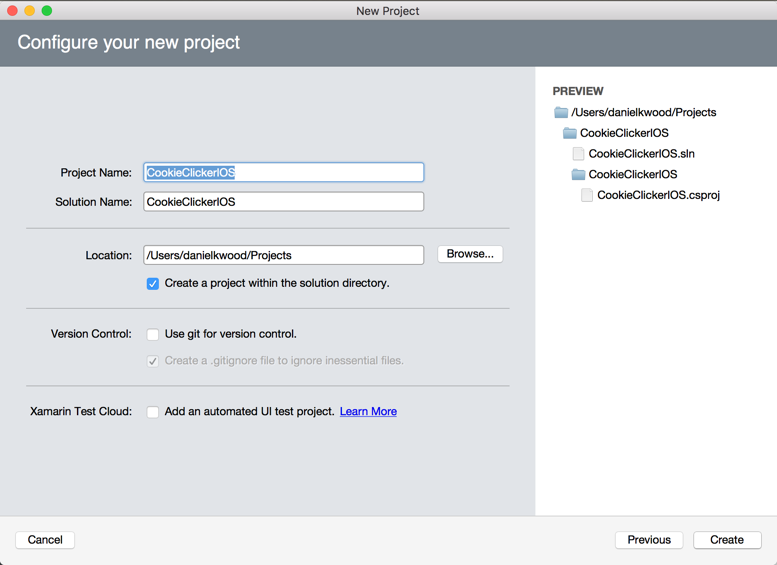 Change the Name of the Button element to cookieButton. 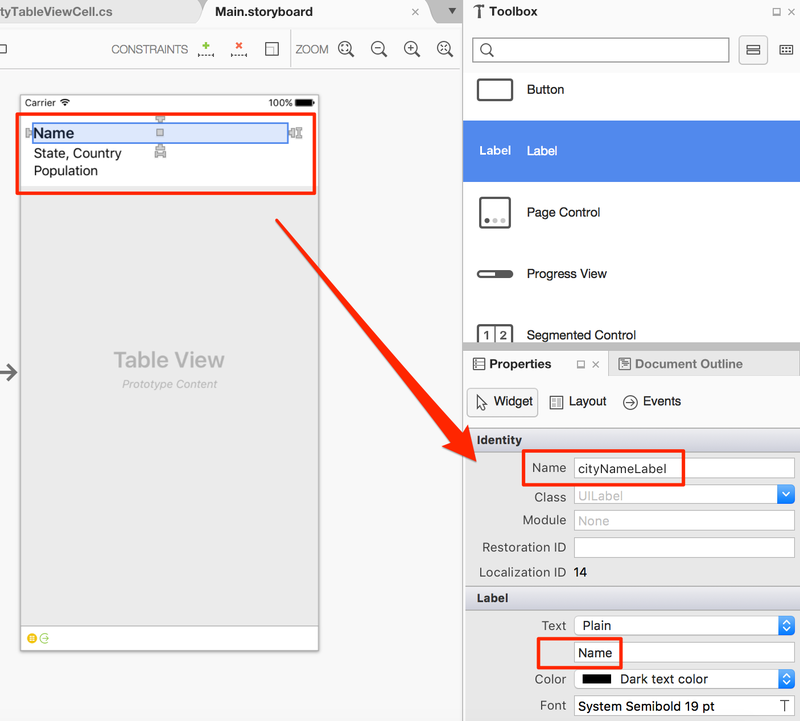 Change the Name of the Label element to clicksLabel. Now all that remains is adding the code that will count and display the number of clicks. 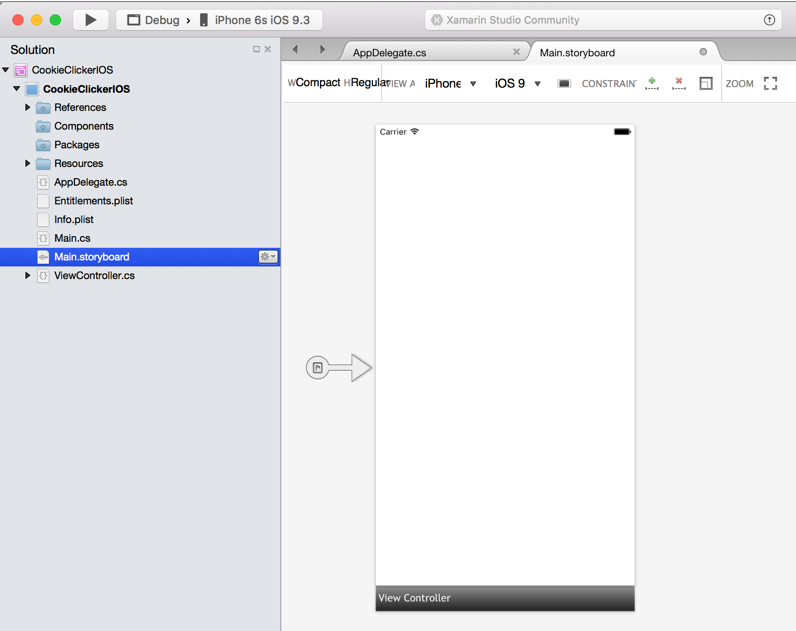 Open the ViewController.cs file to begin coding. Now you need to add a button touch event so that every time the cookie button is touched, the clicks variable’s value will increase by 1. 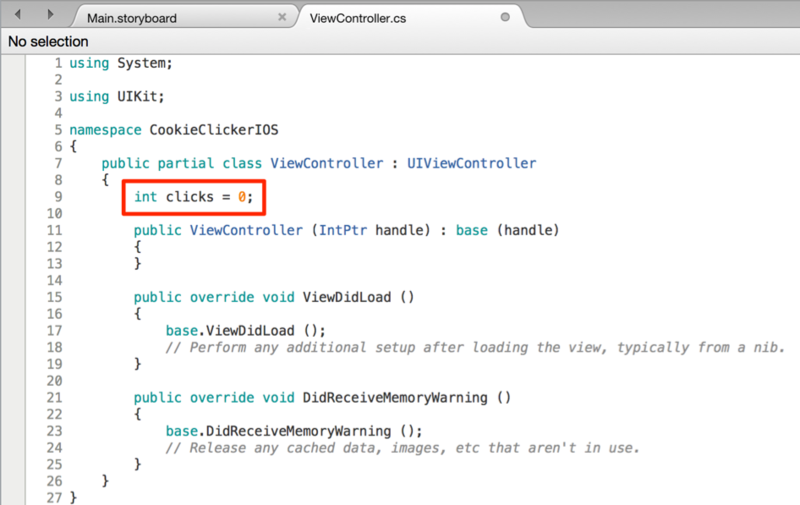 To do this, go to the ViewDidLoad method and make some new space under the base.ViewDidLoad() line. 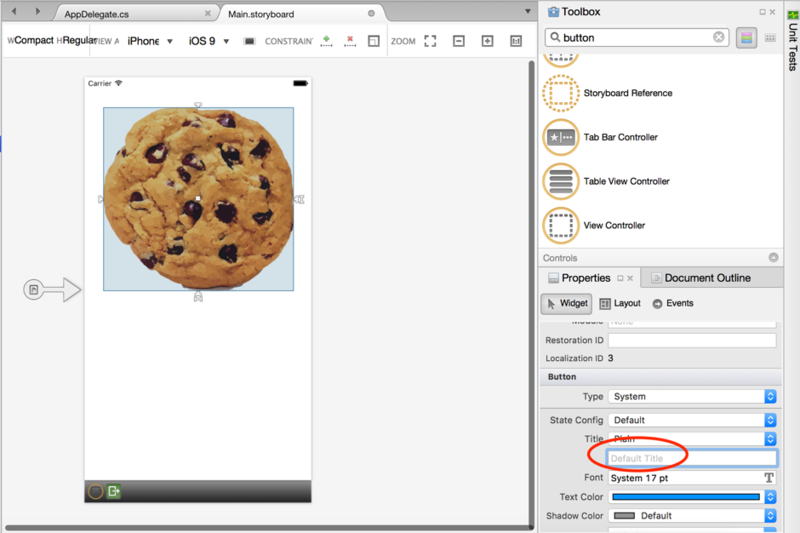 Start typing cookieButton.TouchUpInside+= and then press the Spacebar. As you do this, you will see a list of options. 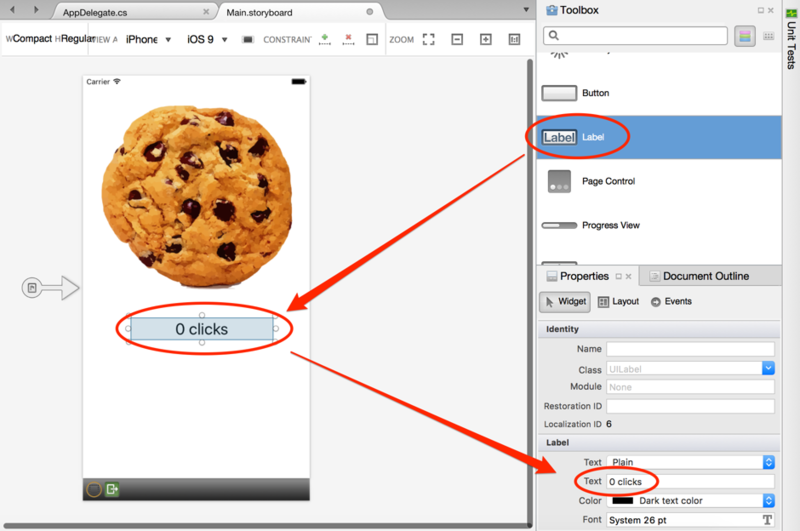 Double click the CookieButton_TouchUpInside option to create a new method. 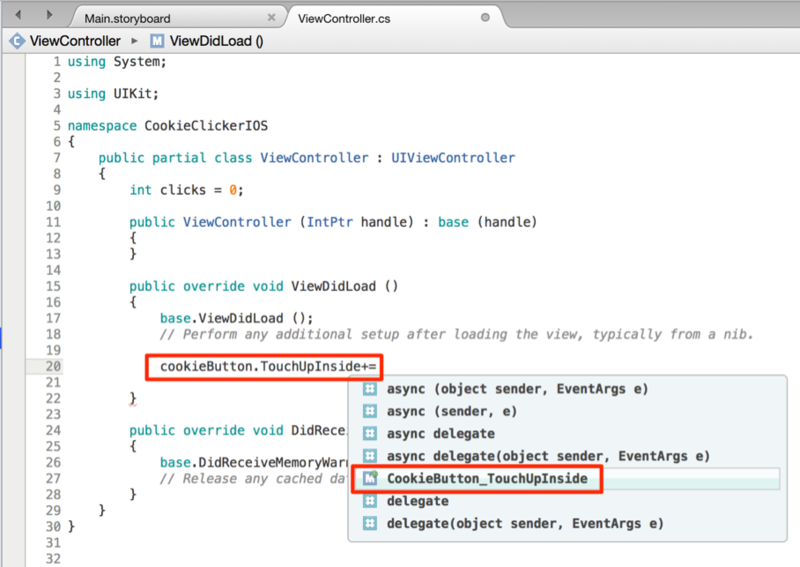 After creating the new CookieButton_TouchUpInside method, you can now add code inside the method that will run when the cookie button is touched by the user. 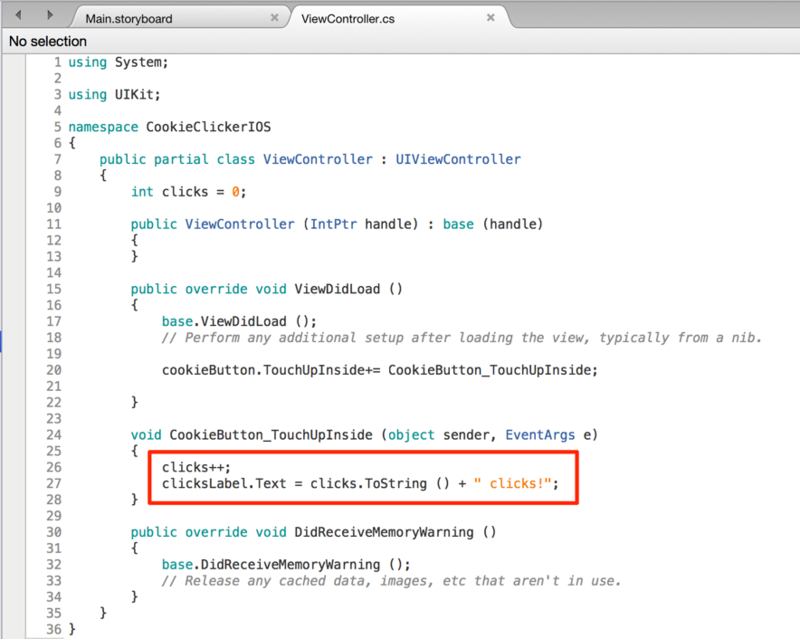 This code should increase the clicks variable by 1 and display the number of clicks every time the button is touched. 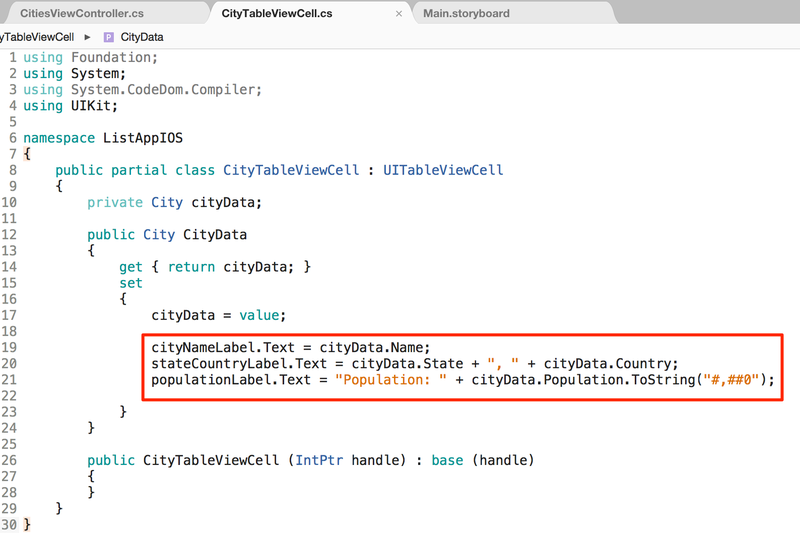 This code will increase the clicks variable by 1 every time the button is tapped as well as displaying the value of the variable and concatenating (joining) the value to the text ‘ clicks!’ – for example 20 clicks! 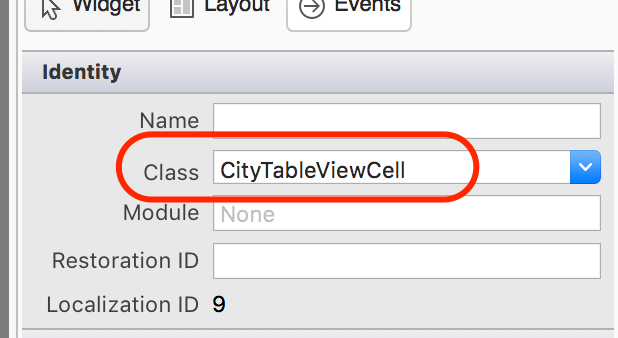 Note that the clicks variable’s value has to be converted to a string before it can be displayed on the button. Now you can test the app! 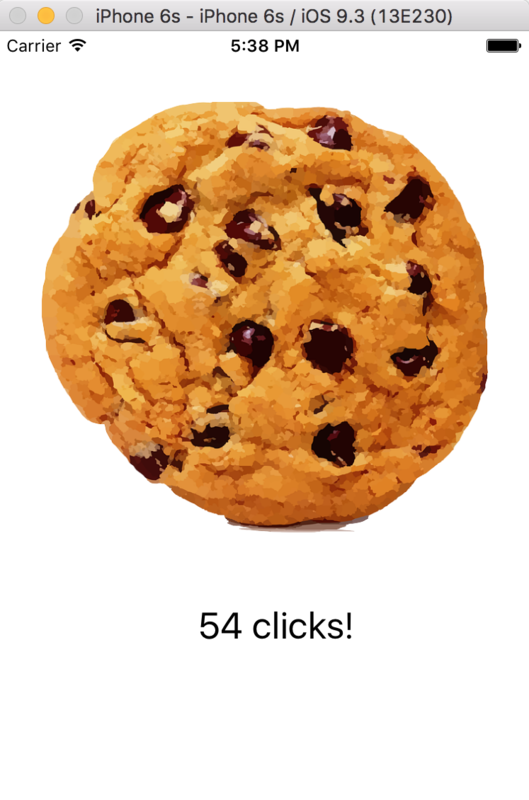 When you test the app, click or touch the cookie button and you should see the number of clicks displayed increased, as shown below. Try extending the app by adding some buttons with the options to ‘buy’ items or unlock items after a certain number of clicks. You could also use a timer to increase the number of clicks automatically over a period of time (eg. 5 clicks every second). 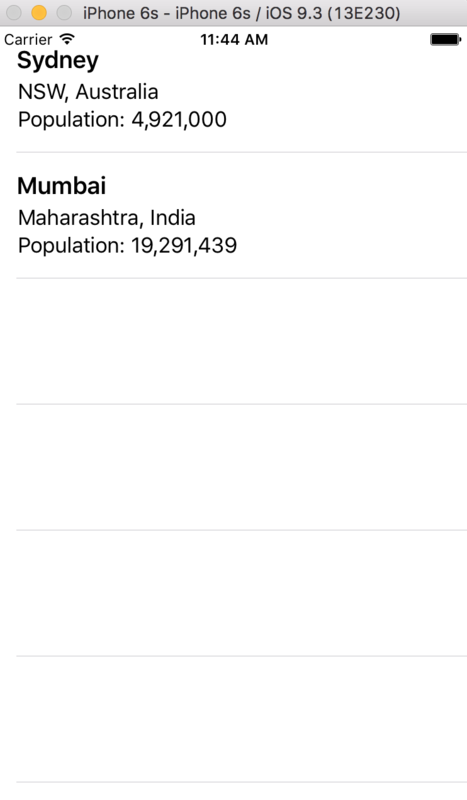 You might also like to change the colour of the text and the background of the app. 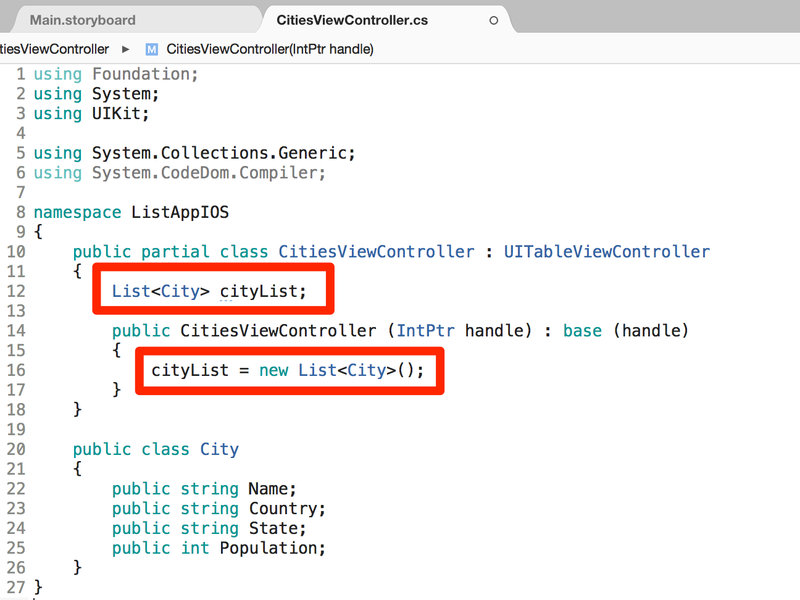 Here is the sample C# code for the ViewController.cs file (please note that the namespace should match the project/solution/app name of your app. It is called CookieClickerIOS in this example.